HIGH COURT JUDGE QUASHES EALING COUNCIL’S DECISION TO SELL ICONIC BUILDING – HISTORIC VICTORY FOR LOCAL CAMPAIGNERS TO SAVE SOUTHALL TOWN HALL. 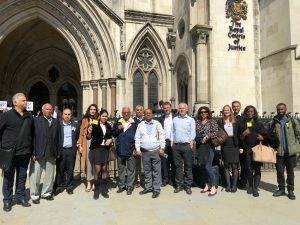 On Friday, the 20th July 2018, the SAVE SOUTHALL TOWN HALL CAMPAIGN won a major victory at the Royal Courts of Justice. In an oral judgement, Justice McKenna has ruled that Ealing Council acted unlawfully and unreasonably in their decision to sell the Southall Town Hall, an iconic public building in west London. The judge’s written decision is likely to be published at the end of this or next week. Justice McKenna was ruling on the two grounds of a judicial review lodged by local campaigners in December 2017. In summary, the judge said there was no evidence, on ground one, that Ealing Council’s Cabinet, despite their claims, had even discussed or considered the social value of the Town Hall. He therefore quashed their decision to sell the building. Although he did not formally rule on the second ground – whether Ealing had complied with a legal duty to conduct a proper Equality Impact Assessment – he stated that if necessary he would not hesitate to rule in the claimant’s favour. The judge was scathing in his general comments about the Council and the process they followed. He said that the council were “grossly inefficient”. They “had failed to have due regard to their equality duties” and failed to “consider the impact of the sale to a single faith group”. The significance of this judgement should not be underestimated. Firstly, it has set a precedent. “The decision of the High Court makes clear that councils across the UK must place communities they serve at the centre of their decision making. A full sale cannot be conducted where the interests and needs of the community are at stake, rather consideration must be had whether to sell buildings less than the highest price. This is a great victory for the claimant, the campaign and for anti austerity campaigners generally as the community value and the use of the building must be properly considered before being sold off to the highest bidder”. Helen Mowatt, solicitor at the Public Interest Law Unit (Lambeth Law Centre). Secondly, the fallout of the judgment could be significant. Ealing Borough is one the most diverse in London but the Council’s repeated failure to address equality issues is likely to erode its credibility even further. “This is second occasion when Ealing has been found wanting on implementing its Equalities duties. In 2008 it was severely criticised by the High Court for cutting the grant of local Black led women’s organisation – the Southall Black Sisters. It seems to have learnt nothing from that period by playing lip service to its legal duties on equalities. Will it learn any lessons for this judgment? We hope so. It needs to change its mindset and direction and agree to work with the local community to save the iconic building. Otherwise it lays itself open to be judged by history for being institutionally deficient and discriminatory”. Suresh Grover, Chairperson of Save Southall Town Hall Campaign. Finally, this historic decision represents the culmination of a mass local campaign to save the iconic Southall Town Hall. The claimant, Mr Mohinder Pal, a member of the IWA (GB) Southall Branch, is a 73 year-old local pensioner with no funds or resources. He fought an epic battle – resembling David versus Goliath – and won. Mr Pal is a user of the building and member of the Southall Community Alliance, a key local group based in the Town Hall. The written judgement is likely to released before the courts go on recess at the end of this month, the press release has been prepared as a response to the publication. The Town Hall is a public asset and an important historical building for Southall’s diverse community. In 1979, It was the scene of major anti-racist demonstration against the fascist National Front at which schoolteacher, Blair Peach, lost his life. In 1994 a proposal to sell Southall Town Hall led to a local charity worker going on hunger strike. It currently houses many charities and businesses providing advice and support to vulnerable people.